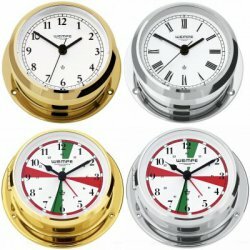 WEMPE Yacht Clocks are available with many different product features. The products of the series SKIFF and PIRATE II can be ordered with Roman and Arabic numerals. Furthermore, we offer two types of housing: colourlessly lacquered and high polished or chrome plated brass. Both open to the front. All WEMPE Yacht Clocks are equipped with battery-powered quartz movement precisely showing hour and minute on the white clock face - so that you always know what time it is. The sizes of WEMPE Yacht Clocks differ - the diameter is either 95mm or 110mm. The WEMPE Yacht Clocks of the series SKIFF are offered with either red or green silent sector and have an alarm function. Thus, they are not only flexible in usage but also decorative. Again, you can choose between chrome plated or colourlessly lacquered brass housing.